An open letter from the DiEM25 coordinating collective to members and friends, proposing a transnational political party as one of its tools for democratising Europe..
For some time now, a debate has been raging among members regarding DiEM25’s possible direct or indirect involvement in elections. Should we? Shouldn’t we? If yes, in what capacity? How can we become involved in elections without losing our ‘movement character’ and our capacity to converse and influence existing parties through dialogue? How can our mission of deepening democracy be made compatible with the rather superficial act of fielding candidates? During the summer, DiEM25’s Coordinating Collective (CC), DSCs (local groups) and members in general have submitted their input to this debate, with the great diversity of opinion that is DiEM25’s trademark. Among ourselves the question now is: How do we move beyond mere debating towards reaching a decision? This question has become all the more pressing after the recent German election which, without a shadow of a doubt, killed off the last remaining hope of a federalist democratic push by the Macron-Merkel duo, the deep establishment's last hope. This is the right time for DiEM25 to respond. Members, DSCs and PNCs are invited to submit brief, specific proposals (that may of course be accompanied by longer explanatory texts) on DiEM25’s electoral presence to be presented to members in an all-member vote. CC PROPOSAL: That DiEM25 will not turn itself into a political party but, rather, seeks to register (as one of its many instruments and initiatives) an ‘electoral wing’; a genuinely transnational party organisation in as many European countries as possible. These organisations would not be independent but bound to the movement’s internal votes. Whether and where DiEM25’s ‘electoral wing’ contests elections will be decided by DiEM25 all-member voting on a case-by-case basis and in accordance with DiEM25’s Manifesto, Organisational Principles and the policy document entitled ‘NOT JUST ANOTHER POLITICAL PARTY‘. From the day DiEM25 was inaugurated in Berlin, in February 2016, we have been saying that we have no urge to contest elections, no craving to hold office or to engage in the daily hustle of what passes for ‘politics’. In truth, we would rather stay out of all this and continue in our chosen areas of activism, read poetry, listen to music etc. while supporting existing progressive political parties. Alas, Europe’s crisis and slow descent into a quagmire of incompetent authoritarianism does not give us the right to do so. This is why we threw our lot in with DiEM25. We consider the model of national parties which form flimsy alliances at the level of the European Parliament to be obsolete. While the fight for democracy-from below (at the local, regional or national levels) is necessary, it is nevertheless insufficient if it is conducted without an internationalist strategy toward a pan-European coalition for democratising Europe. European democrats must come together first, forge a common agenda, and then find ways of connecting it with local communities and at the regional and national level. Forge a pan-European, transnational alliance of existing nation-state-based parties that, nonetheless, adopt a pan-European policy agenda. In that context DiEM25 could work as a catalyst to bring this alliance about. DiEM25 spawns a transnational political party, without becoming a party itself, by which to contest elections and take its Progressive Agenda for Europe to ballot boxes around the continent. Only partially in jest, we call this adjunct DiEM25’s ‘electoral wing’. The strong preference of most of us, at least of the members of the Coordinating Committee, was for (1), if feasible. However, it was never going to be easy. Most existing parties are deeply divided on what should be done with the euro, with the EU etc. DiEM25’s principles are in fact shared between segments of many different parties, but rarely by a party as a whole (with some bright exceptions, like Razem in Poland or The Alternative in Denmark). Forging an alliance with these parties would mean that all of us would have to leave many of our most basic principles unproved outside the door. This is not something any democrat is prepared to do. Indeed, doing this would reduce us all to yet another movement sacrificing its principles to gain electoral power. 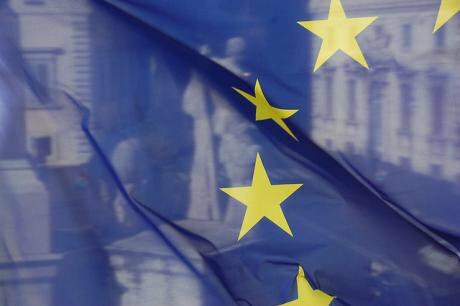 The far-off prospect of a solid alliance that comes close to adopting our European New Deal and radical Europeanism means that only one path remains available to us: If we want our END policy agenda to be offered to European voters as an alternative, if we want our Manifesto and its principles to come to the fore and to be taken seriously by both friends and foes, DiEM25 must create an ‘electoral wing’ – a transnational political party that becomes part of DiEM25’s broader organisation. As a first step, this would mean that DiEM25 seeks to register a political party, depending on national legislations, in various European (not just EU) countries. Where necessary to give these parties a more local, country-specific identity, a name particular to country-specific DiEM25 party offshoots may be registered, crowd-sourced from the members, and after a pan-European internal DiEM25 vote that approves them. This, of course, does not mean that DiEM25’s ‘electoral wing’ should contest elections in every country – in various countries (either due to our own unpreparedness or due to our backing of other parties) we shall offer support to other progressive candidates (possibly of more than one party). What matters, at this stage, is that DiEM25 will have registered a transnational political party in several countries so that, through our internal deliberation, we can confront the task of working out precisely how the national DiEM25 agenda and electoral program could be forged in a manner that: (i) empowers its local members, and (ii) preserves our transnational character and pan-European democratic decision making. For example, we could agree that the electoral manifestos of each country-specific DiEM25 party be proposed by its members based on a local adaptation of the general DiEM25 platform, but that these manifestos need endorsement from DiEM25 in the usual way: a vote of all DiEM25 members across Europe. Equally, in countries where an existing political party decides to join DiEM25, after a vote of all our membership they might be allowed to use the DiEM25 logo. The issue of the relationship between the National Committee of each of those DiEM25 parties and DiEM25’s bodies (e.g. the CC, VC, DSCs etc. ), as well as the relationship between DiEM25 bodies and possible external allies, will need to be hammered out with a suitable extension of our Organising Principles. But it is clear to us that we have little interest in replicating the same old national politics of old. Our aim is to construct what Europe has always lacked: a truly transnational, coordinated movement. Not just another political party! - DiEM25’s ‘electoral wing’ could be the first transnational party with a genuine transnational decision-making structure, a truly pan-European campaign and election manifestos for each country party being approved by all members across Europe. Thus, our German members will have to approve our Greek election manifesto and our Greek members the German one. - DiEM25 will break down the tradition of ‘democratic centralism’ (the idea that its members become subordinate to the party and its majority) with a radical innovation: Members of DiEM25 in, say, each country will not have to become members of its ‘electoral wing’ – the DiEM25 affiliated party in that country. In short, every DiEM25 member will continue to take part in shaping DiEM25 policies across Europe, and in specific countries, without necessarily joining the political party that does DiEM25’s running in their own country – its ‘electoral wing’ there. - DiEM25 will establish a protocol for office holders following a successful campaign of its ‘electoral wing’. For instance, some of us suggest that members who win office should hold it for a pre-specified period before resigning to return to the grassroots. - DiEM25 will attempt to subvert nationality restrictions by fielding candidates from one country in elections in another country (legal constraints notwithstanding). The question of which elections we contest, and which not, will always be decided by our members on a case-by-case basis. However, a splendid start would be for DiEM25 to aim for the 2019 European Parliament elections. General/parliamentary elections will be harder to contest before DiEM25 parties are well established and have done the necessary preparatory work. The 2019 elections offer us a chance to harness Europe’s only transnational democratic moment. While traditional parties remain visionless, trapped in the limits of national competition, DiEM25 can make the pan-European electoral process its platform for Europe’s first genuinely transnational campaign. This will be a stupendous chance to show that another Europe already exists and is ready to make its presence felt from the ground up. All across our continent. 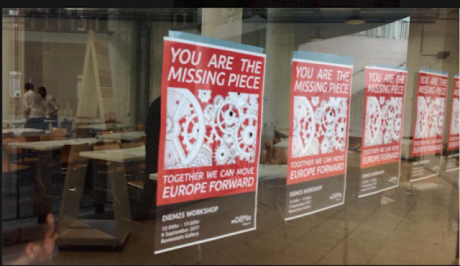 DiEM25 workshop in preparation opposite Bozar, September 9, 2017, Brussels. To DiEM25 members: To share and discuss your proposals or that of the CC go to our forum or a discussion group of your choice. Once you have a final version of your proposal, send it to us via this form. Note that Oct 20 is the final deadline, so we recommend that you plan to submit your proposal via the form by Oct 15, lest any last-minute delays prevent you from making your voice heard on time. Between the deadline for option submissions (October 20) and November 1, the CC undertakes to collate the various responses into vote-able counter-proposals to that of the CC above, as well as to amend its own proposal in view of the feedback. Then, on November 1, 2017, our internal all-member voting process will commence with at least two options on the menu: The (amended) CC proposal (see above), a NO ELECTORAL PARTICIPATION option, and other options that will be put forward by members (as collated by the CC). If the first vote does not yield one option that attracts 50%+1 of voting members, a second runoff round will ensue. As our second anniversary is approaching, this is a decision that we must make, as always, collectively and after we consider fully all views and available evidence. Thank you for guiding and enriching our movement’s momentous next steps!